Today is Perfect Picture Book Friday. I am doing a review of a chapter book for ages 6-10. I know that many parents are moving towards chapter books as their children begin reading on their own. And, although I believe that picture books are wonderful for elementary grades even when kids are reading themselves (for so many reasons), I also know that great chapter books continue the engagement of young readers with the world of books. My favorites were Little Women, Black Beauty and ALL of the Nancy Drew series. And, if G.G. 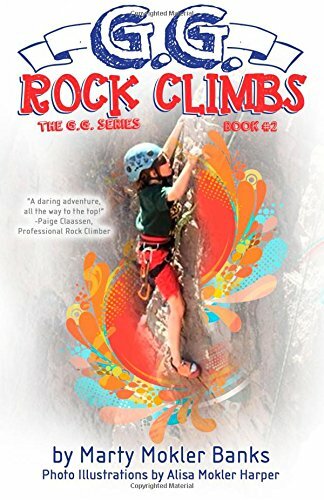 Rock Climbs by Marty Mokler Banks had been around then, I know I would not have been able to put it down. “Does your mom let you have cake? With thick creamy frosting. And little flowers on top? Well. My mom does not! Oh, all right. Maybe on special occasions. But it seems like never. Mom says sugar is Not Good for a Healthy Body. Eight-year-old G.G. climbs all over stuff—from the couch in her apartment to the boulders at the park. So when she’s invited to Stinky Sarah’s birthday party at Rock Star climbing gym, G.G.’s up the wall in no time. G.G. likes it so much, she and her friend, Isaac, take a rock climbing class. When they head outside, things are suddenly more difficult. Can G.G. brave those steep rock faces up Zoo Canyon? Why not visit a local gym or play center that has a rock climbing wall for kids? If you are looking for more wonderful book reviews, please visit Susanna Leonard Hill’s blog. If you are a mom, teacher or librarian, please check out Susanna’s amazing Perfect Picture Book page with over 1000 categorized picture book reviews and activities. And, because today is my grandson’s sixth birthday, here’s a yummy birthday cake – please help yourselves to a BIG slice! This entry was posted in Facing Fears, Friendship, Perfect Picture Book Friday, Picture Book Review, Rock Climbing and tagged #PPBF, G.G. Rock Climbs, Marty Mokler Banks, Rock Climing by viviankirkfield. Bookmark the permalink. This sounds great for Matthew. 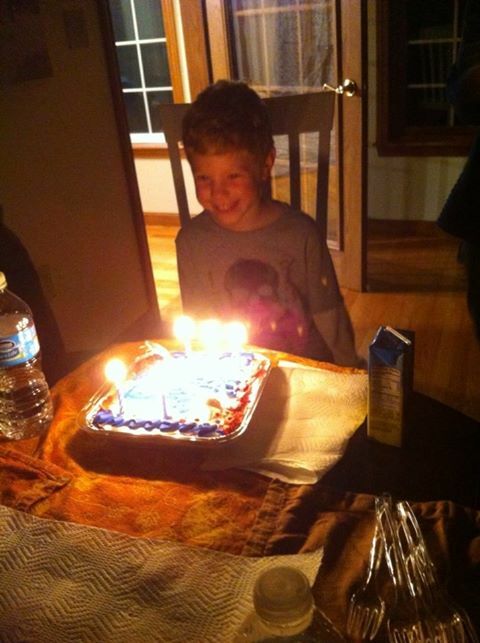 Happy Birthday to your grandson, Vivian! What a great review, Vivian! It definitely made me want to check out this book. Thanks for taking the time to review a fun chapter book in addition to picture books.Congratulations to Marty Banks for her creativity! . WoW … the book sounds wonderful … and so does a Birthday for a special six-year-old. Birthday blessings, sweet grandson. Thank you for sharing that yummy slice of life. Glad to share, Barbara! Tomorrow he is having a party at one of those gym places…with 25 school friends – what fun! Thank you for the birthday blessings, dear friend. And I have not forgotten about the review of YOUR incredible book…it is coming soon! this would have appealed to the adventuresome kid inside me. Thanks, Vivian! I so admire you. So excited to see a second book in the G.G. series – my 9 y.o. daughter loved the 1st one! Thanks so much for sharing both books and cake! So glad you loved the first one, Katey! I don’t think I ever reviewed that one…I should have…it’s a super series! Ooh! I was a rock climber for 20 years and guide for 5, so I know well how confidence-building this sport is. And with the advent of climbing gyms back in the early 90’s the sport has become very popular! And yes, so true that the gym experience is vastly different form the real cliffs and it’s good to let people know that. I will have to get this book for my climbing friends’ kids! Yes, they do, Vivian. I wasn’t confident or assertive and didn’t like myself much when I was a child and young adult. The climbing absolutely empowered me and helped shape who I am today. I’m looking for chapter books for my 8-year-old granddaughter. This is a great suggestion and I think she will like it. Great activities for parents. If rock-climbing had been available as a birthday party option, my daughter would definitely have wanted it. G.G. reminds me of my Little Miss HISTORY character. Have to look at this one! Oh, I think you are right, Barbara! Little Miss HISTORY wouldn’t let a mountain of rocks stand in her way either. 😉 Hope you get a copy! Glad you added it to the list. I read this recently! It’s a fun one and of course, I love Marty’s work. Fun to see two books on the list that I’ve read and that are from people I know. Yes, I just found out about Julie Rowen-Zoch’s new book…hurray for Colorado writers!!!! Soon we’ll be adding yours to the list, Stacy…I know it! Happy birthday to Jeremy! I love that Marty’s G.G. series is all about getting out and getting physical while learning new skills. Reading and exercise my two favorite things. G.G. is very engaging and you can’t help but root for her. I look forward to reading this one. My daughter climbed for a while when she was very young – amazed to see her fearlessness at that time! Takes a lot of courage–for sure! Young kids are often fearless (I wasn’t)…does your daughter still love climbing? Just John then? Ha! Sadly my daughter has no interest in climbing for sport, but on a hike she is quite unafraid of heights, unlike her mother! Yay! for birthdays!! Happy day to all of you! Will you be climbing any rocks? What an excellent book. I used to take my niece rock climbing when she flew from Australia every year since 8 years old to spend two weeks with us during school holidays. Had so much fun with her. Wish I knew of it then. She’s grown up now. Lady of 16 going on 46… if you get what I mean… LOL. Thanks for sharing and Happy Birthday to you sweet grandson. Enjoy the time, they grow soooo fast. Thanks for doing the review, Vivian. And yes to all the Girl Power comments! We’re all a lot stronger than we sometimes think. An especially important message for the young! I hope the birthday celebration was wonderful, and my, my, my that looked like delicious cake! Happy Birthday to Jeremy! What a happy face he has 🙂 Thanks for the book review too! I’m so glad I took the time to check last week’s reviews. This kooks like a terrific book. Thanks.